After Thanksgiving, don't tell your family they're having turkey leftovers until Sunday. Don't even say the word turkey after Thursday! When they ask what's for dinner or lunch, just say "Want some wonton soup?" Or how about ravioli with a lemon butter caper sauce? Just don't say the word turkey because people get sick of "leftovers" after like, one day. So, they just don't have to know.....and you don't have to see the eye rolling or tongue gagging. You can transform turkey just by using it as your protein in some other ethnic class of cuisine. Go Asian one day, Italian the next. Mix it in with some spaghetti sauce & some pasta. Mexican style tamales are also a great idea! For this soup you can buy individual won ton wrappers or the large sheets. I chose the large sheets and cut them with my pizza cutter into 4 pieces. I love the texture of slippery, soft wonton wraps that are dunked in a hot well seasoned broth! 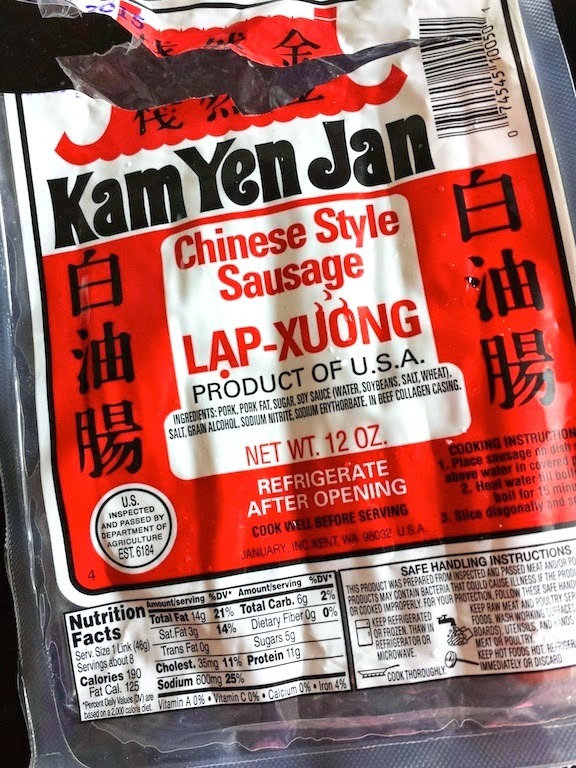 Chinese sausage is most likely only available in the Asian market in your area. At Fubonn in Portland, there are so many to choose from. I'm an obsessive label reader and very anti - MSG, so I found this to be my preferred brand. Why am I anti - MSG? I just try to go as natural as I can when I shop for food to cook. I can't dodge all chemicals and preservatives, but I try to lessen the amount of intake. Traditional Vietnamese won ton soup is called Mi Hoanh Thanh. Yes, that's my name. I grew up in a tiny town called Nashville, Arkansas. When I was little, the boys called me Wonton. I really didn't like it. So I developed a pretty thick skin early. And learned to avoid immature boys. Usually Vietnamese wonton soup has slices of barbecue pork and egg noodles, but I didn't have all that on hand so this is my rendition. At Cartlandia in Portland, the In and Out Kitchen food truck makes excellent Vietnamese wonton soup. Just not with turkey! I hope everyone has a Happy Thanksgiving! This year, I am so thankful to be in the Portland area where my two daughters are going to the most excellent schools. I'm thankful to see my husband so much more than when he was working weeks at a time in Alaska. I'm thankful for a best friend in Little Rock, AR that favorites almost every tweet of mine on Twitter and another best friend in Hawaii who almost always comments on my Facebook posts. I'm thankful that I found garlic - infused chicken broth at Safeway. As soon as I peeled back the silver seal, the garlicky aroma intoxicated me. And I'm thankful for all of you for following, interacting, and +1ing on Google Plus so much that I've had over 2,596,000 hits. Love you mean it! Warm the broth in a medium sauce pan over medium heat. Add the fish sauce. Either grate the ginger with a microplane over the broth, or slice it into smaller pieces and add to the broth. You can discard later. Prepare the wontons. 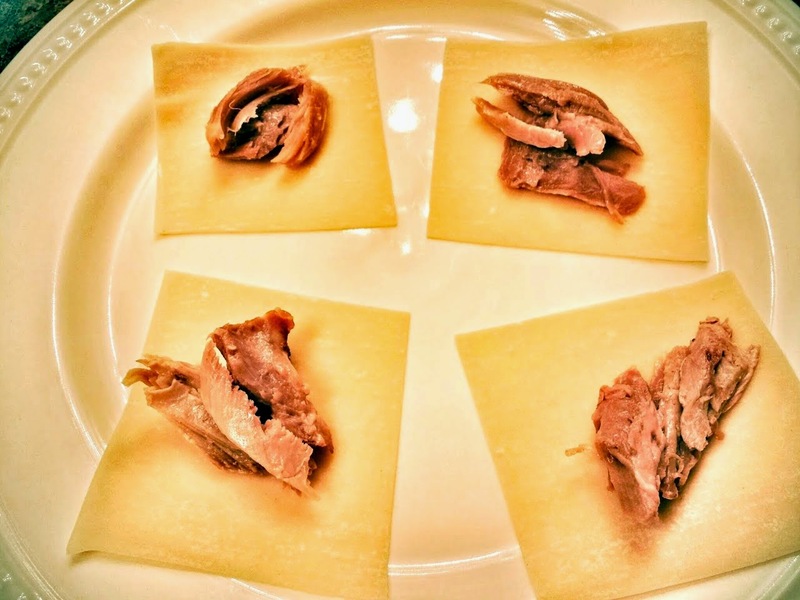 If using a large wonton sheet, cut into 4 squares. Place small pieces of shredded turkey in the center of each. Dip your finger in the water and run along the 4 edges of the wonton wrap. Fold over to make a triangle, then dip the long points with water. Pinch those over to make sure they're sealed. Make 16. 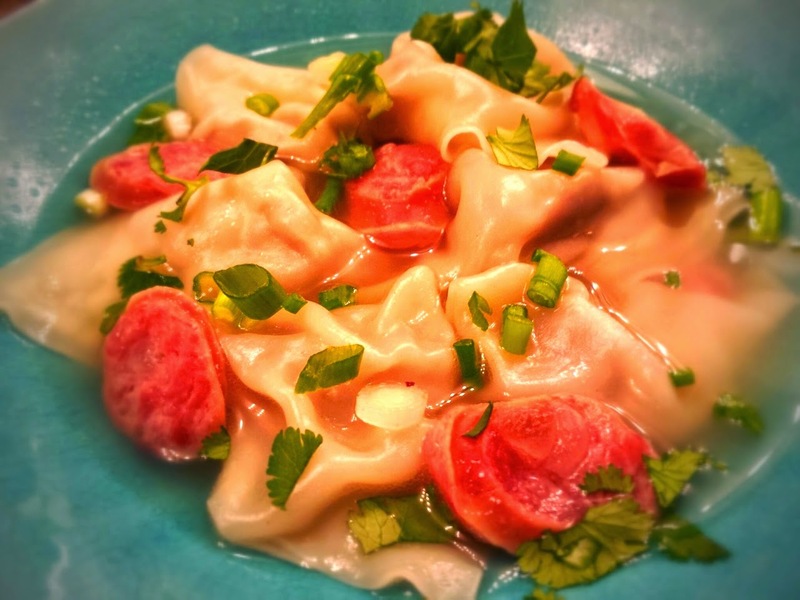 Add one link of sausage to the broth, bring up to a boil, then add 8 wontons for one portion. After adding the wontons, lower heat to a gentle simmer so they don't break apart. 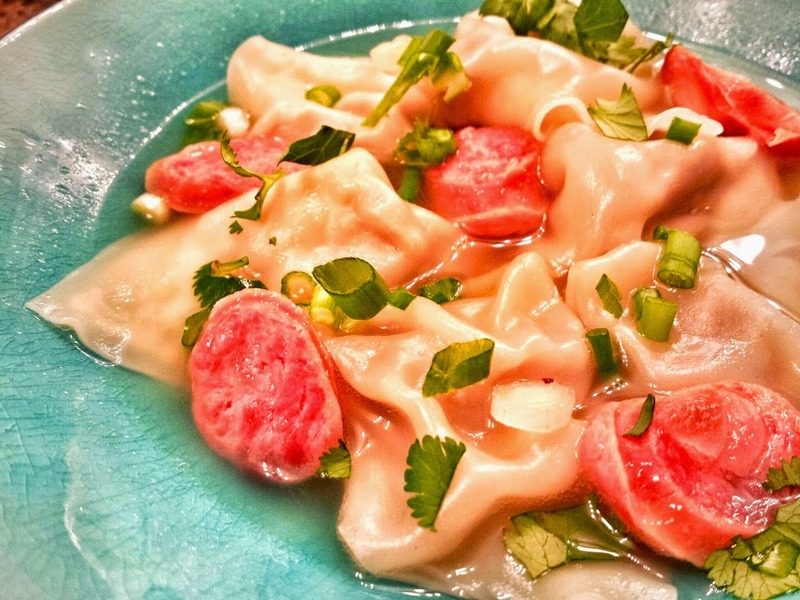 After 2 - 3 minutes, ladle wontons into a bowl. Add the sausage, some broth, and garnish with cilantro & green onions. Repeat process for one more portion.